First published in April 2000, Migrations and its companion volume, The Children, have been garnering tremendous international attention ever since. Exhibited across the globe, from Brazil to Paris and Germany to New York, Sebastião Salgado's photographs continue to tour and to transform the perceptions of those who view them. As a testament to both their power and their relevance, a major exhibition of photographs fromThe Children was mounted as part of the United Nations Millennium Assembly in 2000. In Migrations, internationally renowned photographer Sebastião Salgado turns his attention to the staggering phenomenon of mass migration. In photographs taken over seven years and across more than thirty-five countries, this volume documents the epic displacement of the world's people at the close of the twentieth century. Wars, natural disasters, environmental degradation, explosive population growth, and the widening gap between rich and poor have resulted in over one hundred million international migrants, a number that has doubled in the span of a decade. This extraordinary level of demographic change is unparalleled in human history, and presents profound challenges to the most basic notions of nation, culture, community, and citizenship. The first pictorial survey to extensively chronicle the current global flux of humanity,Migrations follows Latin Americans entering the United States, Jews leaving the former Soviet Union, Africans traveling into Europe, Kosovars fleeing into Albania, and many others. The images address suffering while revealing the profound dignity, courage, and energy of the subjects. 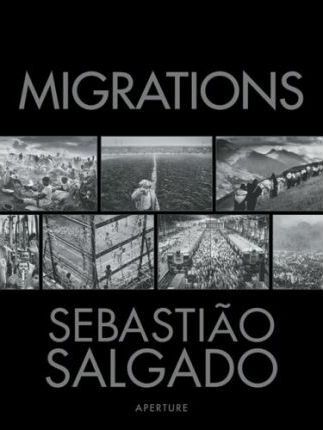 With his unique vision and empathy, Salgado gives us a clearer picture of the enormous social and political transformations now occurring in a world divided between excess and need.First published in April 2000, Migrations and its companion volume, The Children, have been garnering tremendous international attention ever since. Exhibited across the globe, from Brazil to Paris and Germany to New York, Sebastião Salgado's photographs continue to tour and to transform the perceptions of those who view them. As a testament to both their power and their relevance, a major exhibition of photographs fromThe Children was mounted as part of the United Nations Millennium Assembly in 2000. The first pictorial survey to extensively chronicle the current global flux of humanity,Migrations follows Latin Americans entering the United States, Jews leaving the former Soviet Union, Africans traveling into Europe, Kosovars fleeing into Albania, and many others. The images address suffering while revealing the profound dignity, courage, and energy of the subjects. With his unique vision and empathy, Salgado gives us a clearer picture of the enormous social and political transformations now occurring in a world divided between excess and need.